When the cold weather hits, I find myself craving hearty meals like casseroles, stews and soups. Maybe I’m trying to keep my body warm or am trying to make myself feel better now that I know the snow is here for good. Either way, I’m making more comfort foods these days and my family isn’t complaining! One of my favourite types of comfort food is pasta and since I’m all about easy recipes, I like to make one-pot pasta dishes. It means less mess for me to clean later and my kitchen doesn’t look like a cyclone came through. The best kind of pasta recipes are ones where the pasta cooks right in the dish. No boiling required! You also save on having to use a colander to strain the water which is great. My colander is so big it won’t fit in the dishwasher and I need to wash it by hand in the sink. See what I mean about less dishes? This collection of one-pot pasta recipes will satisfy my longing for comfort food and are also all recipes that my family will eat. Now to decide which one to make first! Which recipe in the collection is your favourite? I definitely love my pasta and trying new dishes! These sound fantastic! I will be trying the Skillet Pasta And Chicken Parmesan Recipe first! Thank you for sharing them. Thanks for the recipes, I only had two or three one pot recipes in my collection. Now this looks and sounds delish!! I’m gonna give it a try, thanks for the heads up! Yummy! My weakness is pasta, love to try new ones, thanks! I’ve had a quick peek at some of the recipes, delicious there’s no other word to describe the ones I looked at 🙂 I’ve made a note of a couple to try out very soon! 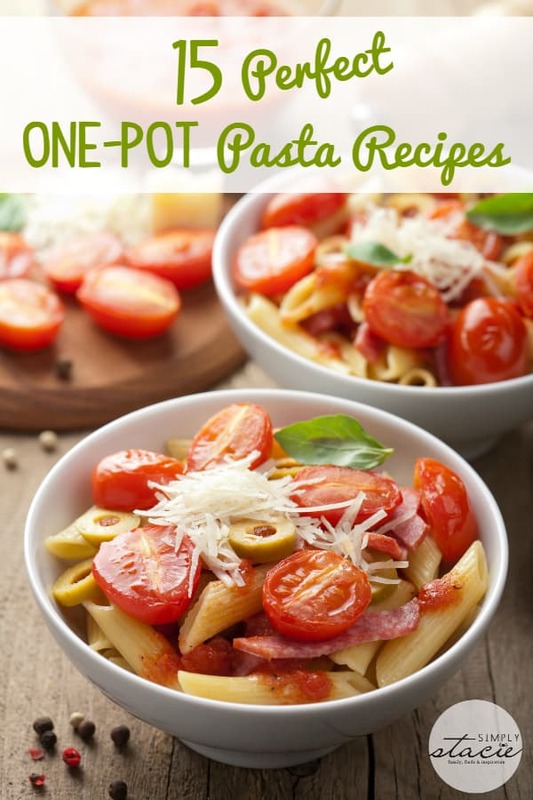 I love one pot recipes, easy fixing and easy cleanup and who does not like pasta!! I love one pot wonders! Easy clean up and a time saver. The Skillet pasta and chicken parm looks great. Hearty pasta dishes are always our go to for the cold winter. I love Foodie.com so much! From your collection, I’d have to say that the One Pot Spinach Pea Pasta looks the best! Pasta is such a comfort food. My favorite recipe in your collection is Easy Tomato Spinach Pasta, I also like the One-Pot Spicy Chicken + Rigatoni. Thank you for sharing these great recipes. We are the same way. The colder weather makes us want comfort foods. We use the crockpot, oven, and stove to warm up the house and bring in wonderful smells. How great to have good foods that also have an easy one pot cleanup. The beef stroganoff looks great! I am a big fan of one pot meals because they are so simple and fast! Oh Thank you so much! We are big pasta eater. So I am always looking for new recipes. This will be perfect for me to try over the holiday’s when I have guest. Thanks! Always appreciate more recipes for one “pot” dish meals. Foodie.com is great!! The Skillet pasta and chicken parmesan looks like it would be a big hit in our house! I love easy recipes!! Spinach and pea……yummy! Great recipes for sure! I’m always looking for new pasta recipes, thanks! I have always been a fan of your food collections.Love these pasta recipes and especially love the Skillet Pasta And Chicken Parmesan Recipe !! !Thank you for sharing them. Thanks for all the great recipes! They will make the pot-washer in our house(me) very happy!! These are great recipes.I love past dishes and being I’m a working parent,sometime easy dishes are the best way for me to go.Thanks so much for sharing. I love pasta and I really like that these are one-pot meals! So delicious! Everyone in my house loves pasta! There are 15 pot pasta dishes here and they look delicious.I love pasta and and am always looking for a good recipe.I keep coming back here every so often.Thanks fo this post.